Today the Newton's Nook Designs Team is proud to be hopping along for the 2018 Stamping for Autism Awareness Blog hop! We are joining Veronica Zalis and tons of other amazing stampers to help raise autism awareness! We hope you will help us spread the word and follow along with us. There are going to be TONS of fun prizes too - including a $25 store credit from Newton's Nook Designs! So for my card today, I used various Newton's Nook Designs products which I will link as I go. I was looking for a positive and inspirational sentiment for this hop. I chose the You Lift Me Up sentiment from the recent release, Uplifting Wishes and heat embossed it in white. The text does blend into the clouds, in photos it's a bit hard to see. I cut a cloud border out of cardstock using a die from the Sky Borders Die Set. Then inked my clouds using Peacock Feathers Distress Ink along with my die cut (stencil). I copic colored all my images using Winston Takes Flight stamps and diecut them using the matching Dies The scalloped die was cut from Frames & Flags Die Set. Oh! And the tiny hearts I stamped on my banner came from Newton Scoots By. We will be picking ONE lucky winner from our own blog hop! This prize is in addition to the one we are sponsoring over on the hop hosted by Veronica. So cute, thank you for sharing and promoting this worthy cause. A wonderful cause to get involved with ! wonderful car, great cause, and fantastic company ! Wonderful card for an awesome initiative! Thanks to everyone who are part of the blog hop, and to the sponsors! What a cute and encouraging card! I love it! This is super adorable and your coloring is fantastic! Love it! What a darling and encouraging card! I love the design of this card! It's so beautiful and vibrant. So encouraging! Thanks for bring Awareness to Autism! Newton’s Nook has cute critter stamps! Nice coloring of your flying raccoon. Like that the plane pops out on your card, too. What a worthy cause for this blog hop! Your card is AWESOME! I especially love the coloring! This sentiment works perfectly with Winston in the plane! Fabulous card for a worthy cause! I love your card. It is really cute and the sentiment fits right in with the theme. Such a cute card and a great cause. Thank you for taking part!! Your card is adorable. This is such a wonderful blog hop!Thank you for your support for this wonderful cause!! Fantastic project! Great card and I love the sky! Such a great blog hop too! Great card! Thanks so much for taking your time to support such a worthy cause. Have a great day. Thank you for supporting Autism Awareness. I have a young friend who has Autism. He is a special and bright young man. Love your card. Definitely an uplifting card. Adorable! What a great way to remind everyone that we are all unique and if we open our hearts we can see the beauty in everyone. I love your card it says it all. What a cute card. So glad you're helping . What a cute card! Love that NN image. Your Copic coloring is so good! You really brought the little critter to life! Such a cute card. It would definitely lift my spirits! Such a fun card with the uplifting comment. Great colouring too. This is a very important topic to bring to the forefront to raise awareness. A really cute card and a good cause! What a super cute card and this stamp fits so well with the sentiment! I just love the airplane. Thanks for spreading such inspiration for the cause. This is adorable! Love the scene with this little cutie! Thanks for spreading the word. I like your background sky for sure and the bear in the airplane is adorable. A very good cause. Love this card. So playful. Your card is very cute!! Love it and the whole Blog Hop!! Thank you for sharing!! Love your card and such a great way to spread the word for Autism Awareness! Adorable card. Great blog hop! Great card for such a worthwhile cause! Thank you for participating. Very bright and colorful card. Raccoon is so adorable! Cute card! Love this cause. It is close to my to my heart. What a cute card! Love all the clouds! This flying Winston is one of my favorite, he's so cute with his glasses ! Thank you for your generosity ! An adorable card with an inspirational greeting.....I love it! So cute! I love this initiative! After homeschooling my 5 children for 27 yrs, I took a job as an EA/TA to a 7yr old boy who was on the autism spectrum. He also had FASD. I was with him for 3 years and LOVED it all! Thank you for bringing forward more awareness of the awesomeness of these children. I love your card, it is so cute. Such an amazing way to bring awareness, thanks for doing this. That card is soooo cute :) great job! How adorable is Winston! Love your uplifting card! How cute! An uplifting card for sure! Love it! I love this card! beautiful scene and a fun design. Thanks for being part of the hop and raising awareness of autism! This is so precious! Thanks for the inspiration! What a fun and happy card! So beautifully colored and executed. I just got this stamp and love how you created your card! A super cute card Amanda. Very encouraging and perfect for this hop. So uplifting! Thanks for supporting the Autism Awareness Day & Blog Hop. Super cute card, the sentiment is adorable! Such a cute card! The colors and design really are uplifting. Thank you for helping bring awareness to autism. I have a daughter who has Aspergers she is 25 now and still my extended family don't understand. For some reason they expect that she one day will magically be doing what a typical 25 year old would be doing. Sadly it brings more tears the older she gets. Love your card. Wonderfully done. Your card is adorable, love the copic coloring on it. Thanks for sharing your card and talent to highlight Autism Awareness. I love this card. The font for the sentiment is adorable! Very cute card! Thanks for sharing. Great card! thanks for participating in this blog and supporting awareness of autism. Thank you for participating in this event! My grandson is autistic and not enough people understand the struggles they see. What a great card for autism! What an adorable card! I lov ethe way you did the clouds. Such an adorable card. Love the message. Cute, cute! Your cloud background is so pretty. Great card! Thank you for supporting such worthy cause! Adorable card - such a wonderful choice of sentiments. Wonderful card for a wonderful cause ! LOVE this card, Amanda! It's absolutely adorable and so cheerful, you totally nailed it! Fantastic card for a wonderful cause! Love how fun and energetic it is! So very sweet and a worthy cause! such a cute card with a great message! Another mama with a beautiful 30yo son with Autism and a 28yo daughter that teaches Special Ed with a true passion! So very proud of them both, and grateful to you getting this blog hop going! Sporting my blue today, and have my front porch blue bulbs glowing! Fun card by the way!! What a cute card and the message is terrific! This is such a great idea for a blog hop! Thanks for participating for this great cause. I love your cloud background- I always struggle with inking these properly. The airplane is adorable. This is so cute!! That little guy in his blue airplane is just adorable!! I also love the color you chose for the clouds in the background. Love your design and that you used Winston for your card! Thanks for bringing awareness to this worthy cause! That little guy in the plane is precious! A wonderful card for a wonderful cause! Super sweet card I love it!!! Gorgeous! I love all the blue in this hop. Great cause! Thank you for supporting Autism awareness. My daughter is on the spectrum and I appreciate your support. The card is beautiful! This is gorgeous! I LOVE Winston in the plane--the colors are amazing! This is such an adorable little card I just love the airplane! 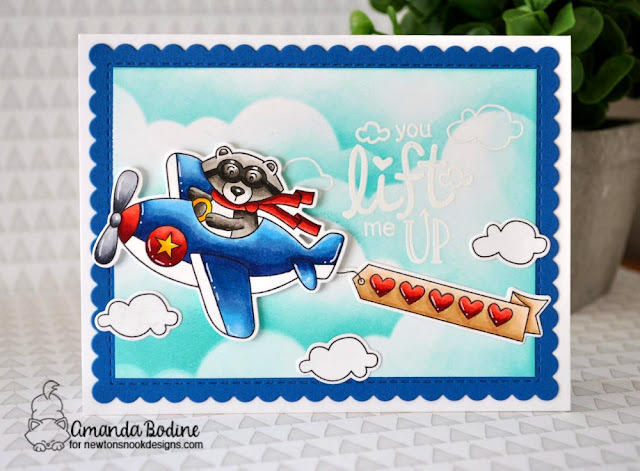 A raccoon flying an airplane...so cute! What an adorable card! Thank you for promoting autism awareness! Very cute card and a great cause. This has affected my family and others so it really helps if people understand the big picture of Autism. Thanks for your support. Thank you for supporting the awareness campaign for autism! What a sweet sentiment. We all need to be lifted up because our kids can be trying. Cute card...the flyng banner behind the plane. So cute. I like your coloring and the sentiment in the clouds. Love, love, love how the crafting community has jumped in to help raise awareness for autistic. So proud of my community! Your card is amazing. Oh gosh, this is so cute! Thank you so much for participating in this worthy cause! Very cute and inspiring. Thanks for sharing. Wonderful card for a noble cause...Thanks for helping spread awareness!! What a cute card for such a worthy cause! That is adorable. Thanks for bringing attention to the autism community. Adorable card and great sentiment - perfect for this hop! Thanks for raising awareness for Autism. Very cute card. Love the sentiment for this very special cause. Adorable card - I love he depth you created with the sky and your sentiment! Thanks for supporting this great cause! Super cute card - so bright and colorful. Sweet card!! I love your coloring!! adorable stamp illustrations! I love the plane! Thank you for supporting autism awareness. What a sweet scene! Thank you for your support of such an important cause. What a darling card! Awesome coloring! Super cute card, fabulous colouring. Such a beautiful card! I love the pairing of that new sentiment with Winston in the airplane! So perfect! The hearts on the banner are adorable too! Thank you for hopping along with us to spread awareness about Autism! Fun card!! Thanks for participating in the Autism awareness blog hop. Love your products. Awesome card with an uplifting message. Thanks for sharing. What an adorable card and more uplifting is the sentiment! This is just the sweetest card! The sky turned out beautiful! What a cute card! I love the background. Lovely card you made for the Autism Awareness cause with the blue colours. Adorable card! Love your pretty coloring! This is an uplifting message and extremely cute. I love the bright colors! Adorable card. So colorful & uplifting. Such a sweet sentiment on this fab card. Thanks for supporting this cause. How cute is that little raccoon !! Love the pilot on this card! Darling! Thanks for your support to raise the awareness of autism! Oh, goodness....how cute is that card with the critter in the airplane!! So adorable!!! Thanks so much for supporting this important cause! Cutest little pilot ever! And a lovely sentiment.